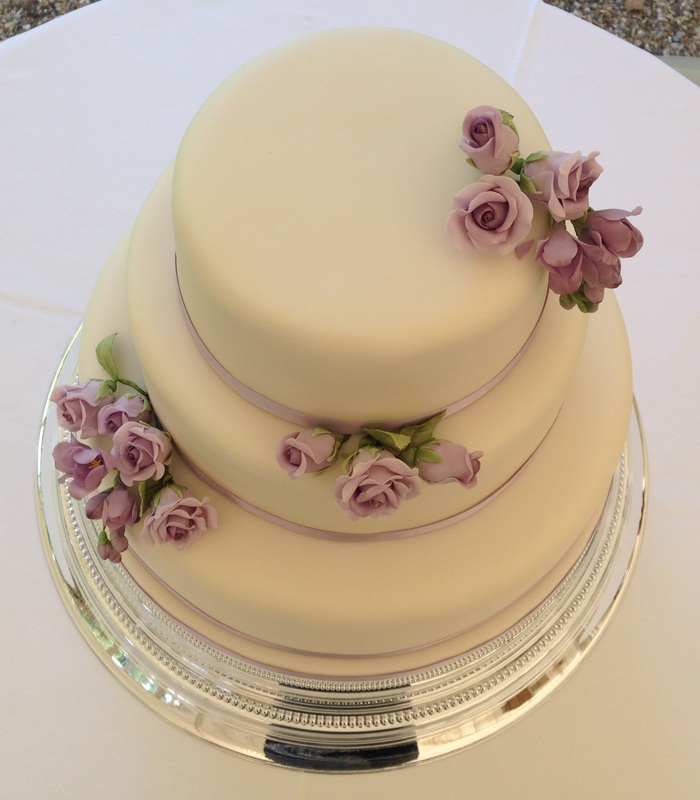 Just before Christmas last year, a family friend, Emma, asked if I would be able to make her wedding cake. Despite not living near where the wedding was going to be I said yes since it was near my parents so I thought it would be a good chance to go back to my parents for a few days. However, that didn’t happen – instead mum, dad and Becky came up to stay with me for a few days and then took the cake back. Becky even assembled the cake for me! 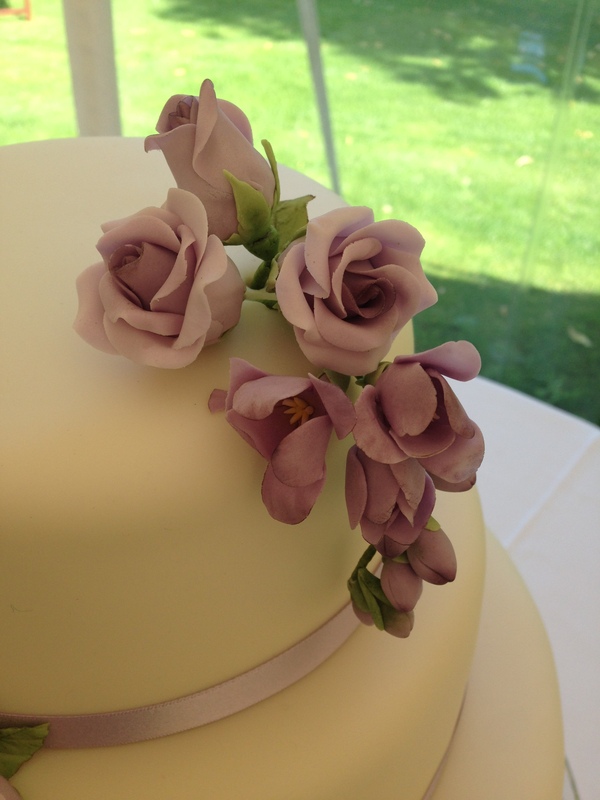 This is now one of my favourite cakes – I love the simplicity of it and the way the freesias fall off the side. Emma had only specified the type of flowers and colour. 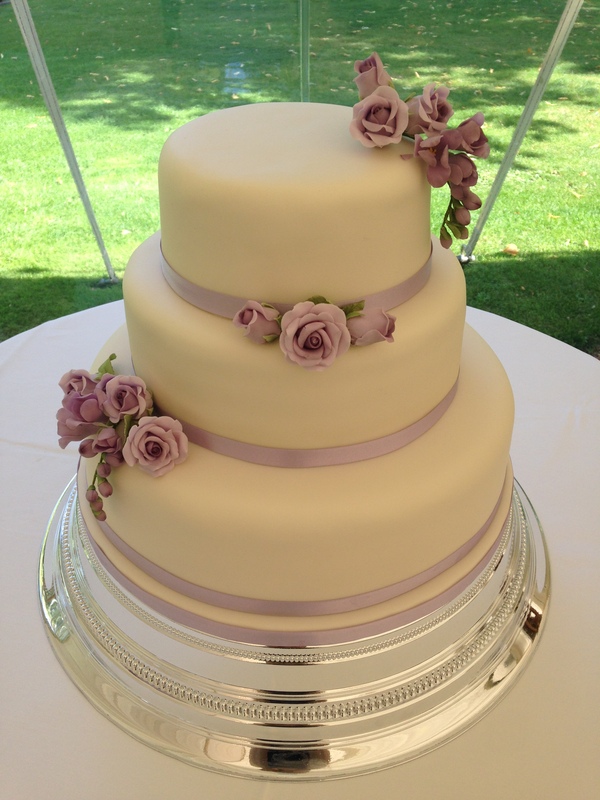 My initial plan was to do a couple of roses and a stem of freesias curling round each tier, alternating sides up the cake. 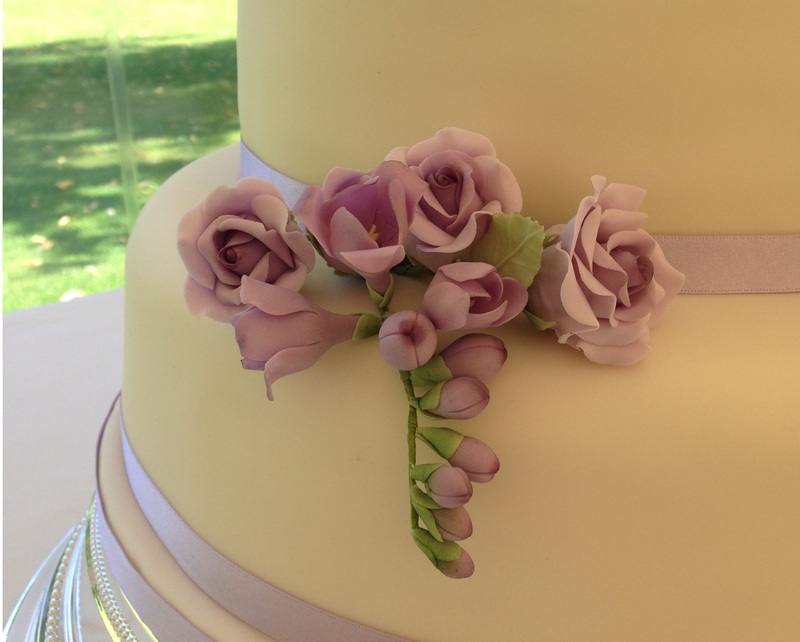 However, after making the freesias and experimenting with arranging the sugar paste flowers on cake tins, I decided that draping over the edge looked much better. Setting it up on cake tins also helped Becky know how to arrange the flowers when she got it to the venue – she arranged them perfectly! Emma and Dale decided that they wanted fruit cake and a raspberry and amaretto sponge. I’d never made a raspberry and amaretto sponge before so I made up a recipe. A couple of days before I made the cake I realised it was a bit of a risk to bake a 9″ and 12″ sponge using a recipe I’d made up without even trying it first. So I baked an 8″ version. Luckily it worked perfectly – I had based the quantities on a BBC Good Food vanilla cake so I was fairly confident it wouldn’t be a complete failure. I sliced the 8″ cake in half to check the marbelling had worked, and then levelled it off, so I could taste the sponge, but then I froze the cake – something to look forward to at some point! If you want to have a go at making it, the recipe is below. The recipe below is for an 8″ round cake – for the 9″ cake I used 1.5 times the quantities and baked it for 1 hr 45. For the 12″ cake I used 3 times the quantities below (I had to mix it in 3 separate batches) and baked for 2 hrs 15. Almond buttercream – made using this recipe, but substitute the vanilla extract with 1/4 tsp almond essence. Preheat the oven to 160C/140C fan/gas 3 and grease and line an 8″ round cake tin. Cream the butter, sugar and almond extract together until pale and fluffy – I left mine in my KitchenAid for about 5 minutes on a medium speed, scraping the mixture down from sides a couple of times. Add the eggs a bit at a time, making sure it’s fully mixed before adding the next bit. If it starts to look slimy/curdled, add a bit of the flour. Once all the egg has been added, beat in the yogurt and amaretto. Fold in the flour and ground almonds. Spoon the mixture into the tin and then add spoonfuls of the raspberry jam mixture – use a spoon and a skewer to swirl it around, ensuring it doesn’t all stay on the top. You don’t want to mix it too much because you want to create a marbled effect. While the cake is baking make the syrup – combine all the syrup ingredients in a small saucepan and heat until the sugar has dissolved. Leave to cool. Once baked – it should rise up when pressed gently and a skewer should come out clean – leave the cake to cool in the tin for 30 minutes. Pierce the cake all over (make sure you go all the way through, don’t just prick the top of the cake) and drizzle the syrup all over the top, ensuring it soaks in fully before adding any more. Leave to cool slightly and then cover with a tea towel – this will help to prevent the cake forming a hard crust. Once completely cool, remove from the tin, slice into 3 even layers and sandwich together with buttercream and raspberry jam.